The rise in the uptake of the MMR jab has stalled at a level where a measles epidemic is still possible, NHS figures for England show. NHS Information Centre data revealed 85% of children in England had had the triple jab by aged two in 2007-8 - the same as the year before. Uptake had been rising since plummeting to a low of 80% four years ago after the jab was wrongly linked to autism. To achieve herd immunity, 95% of children need to be vaccinated. Reaching this level of coverage means those who have not had the jab are also protected as immunity levels are so high that an infection cannot take hold within a community. But the vaccination rate has been well below the level required for that for several years after the Lancet medical journal published the controversial research in 1998. The study has since been discredited, but confidence has been slow to return in the combined measles, mumps and rubella vaccine. Nonetheless, uptake had been rising since 2003-4 until the latest figures were published. It comes after there has been a rapid rise in measles in recent years with 1,000 cases recorded in 2007. Government officials have urged primary care trusts (PCTs), which administer the MMR programme, to try to increase vaccination rates. They said without an improvement a measles epidemic would happen "at some point". However, just 24 out of the 152 PCTs recorded uptake rates of over 90% and none achieved the 95% mark. London had the worst record with the overall average for the capital below the 80% mark - although not all PCTs had complete data. By age five, 74% had had the second dose the figures also revealed - this is offered to mop up the one in 10 children who fail to develop immunity with the first dose. 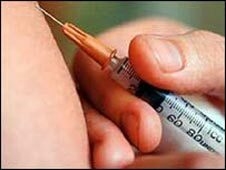 But officials said the overall vaccination rate could be higher as some parents may be organising separate single vaccinations instead of the three-on-one. Professor David Salisbury, the government's director of immunisation, said: "MMR uptake is still not sufficient to remove the serious threat of measles outbreaks. "Parents who have not had their children vaccinated with the MMR vaccine should do so now. "The evidence on MMR is absolutely clear - there is no link between the vaccine and autism and delaying immunisation puts children at risk." And a spokeswoman for the Health Protection Agency urged parents to get their children vaccinated as there were still "outbreaks of measles" happening.